This article has links to products we love, which we may make commission from. Beaches, parties, delicious dining, and amazing activities – the Carnival Horizon Cruise is an amazing ship. Whether you are traveling foodie or a family looking to get away the Carnival Horizon has something for every type of traveller. However, with all the excitement of planning a cruise, we often get carried away with what to wear on a cruise. This Caribbean Cruise Outfits guide and packing list will detail all the best choices for your cruise. 2 Sets of Accessories that goes with all the outfits. The best Cruise wear is from Lilly Pulitzer especially if you want to match with your family. Lilly Pulitzer is my top choice for finding matching cruise outfits for you and the rest of the family. Choose a print you love and see what is available matching for mother and daughter and sometimes fathers and son too. During the day, you can wear UPF 50+ Lilly Pulitzer dresses that protects you from the sun. UPF 50+ dresses and tops are made of Solsafe ™ a machine washable fabrication that helps protect you from harmful UVA and UVB rays with a UPF 50+ rating. Solsafe is a knit with a high twist yarn that gives a cotton like feel to the fabric. For a 8 night cruise, you can pack four bathing suits and up to four Cover-ups. Since you are in the water so much during your Caribbean Cruise, you will need at bring at least two bathing suits because they usually don’t dry overnight and you wanted to be able to go to the pool everyday. For bathing suits, La Blanca swimsuits my favorite choice. They fit beautifully and hold up your decolletage while still being comfortable. You can find an awesome selection on Nordstrom’s website, Everything But Water, and you can get good deals on the Nordstrom Rack website. Miracle swimsuits are also a great choice of swimsuit for your cruise. They fit a little tighter than most swimsuits because they perform a miracle and slim you down like crazy. It is like wearing shapewear. See the current selection of Miracle suit here on Nordstrom’s website. Get this cute mommy and me swimsuit here. Choose cover-ups that you are comfortable in. You can bring a variety of coverups so that you wear each one to suit your cruising needs. My personal faves are kaftans and sarongs. Kaftans are easy to wear on the cruise because they are like wearing a small dress. You can easily wear this all day. They can also double as a top over leggings. To easily match almost all swimsuits, choose a black or white kaftan. Also, tropical prints like palm trees or pineapples are a great choice too. You can also find one that has internal belt tie that you can use to define your waist. Most cruises have at least one formal night. For cruises like the 8 Night Carnival Horizon cruise, there are two formal nights. The formality of formal night varies. You can wear everything from evening gowns to casual dresses. It is really up to you how formal you want to get. Personally, I like being a little dresses up for dinner every night and formal night is no different. One of my favorite places to shop for dresses is on eShakti. They have amazing dresses that can be customized to your measurements and the neckline, sleeve length, and dress length. It’s spectacular!! Get $25 off your first order with free customization here. If you are going on a cruise as a family, you can do your best to match at least once during the trip. It’s fun and will look awesome for holiday cards and as you Facebook cover photo. Old Navy has a really fun print out right now that is perfect for cruise wear. It’s a fun lobster print that is very nautical. Choosing a nautical look for your cruise is an easy and fun choice because you are on the open water – nautical is very fitting. 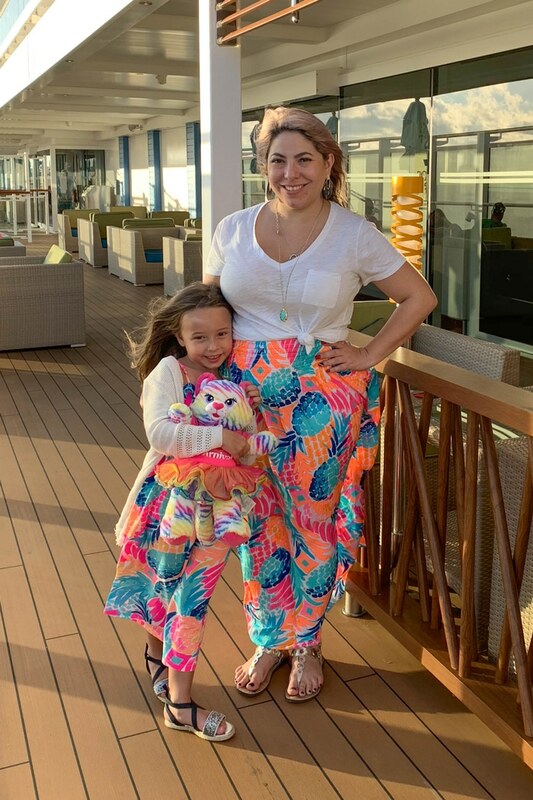 If Old Navy no long has these prints, check out my post on mommy and me looks that I update all the time when Old Navy has new family matching prints. They always seem to have some sort of navy blue print out that has family matching pieces. Maybe because navy is in the title of the brand. You can also get matching swimsuits at Old Navy. They have some really cute choices in lobster print and gingham. During the cruise, flats are the best. You are on vacation and want to be comfortable. After years of research into comfortable stylish shoes, I have found that these shoes are the best. My go to sandal for cruising are these Clark sandals and Sam Edelman thong sandals. I have worn them on multiple cruises and have never regretted it! I like getting sandals in a neutral metallic so that you can match everything you wear. For formal evenings or when you have a night out at one of the many restaurants on the Carnival Horizon, you could wear a pair of wedges like these Naturlizer wedges. They are pretty darn comfortable, but if you find an embellished flat sandal that is comfortable, you can skip heels all together. For days when you are off ship and will be walking a lot, you can rock a pair of slip on sneakers that you have already broken in before the trip. I am in love with these Maryanne slip-on sneakers from Naturalizer. I have them in a light blue color that I found at DSW. They didn’t have a breaking in period which is amazing!! Are you ready for your next cruise on the Carnival Horizon?